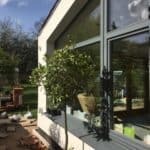 The PERFORMANCE range suited the budget, thermal performance and airtightness requirements of the project and we’re really pleased with the aesthetics and robustness of the windows and doors. 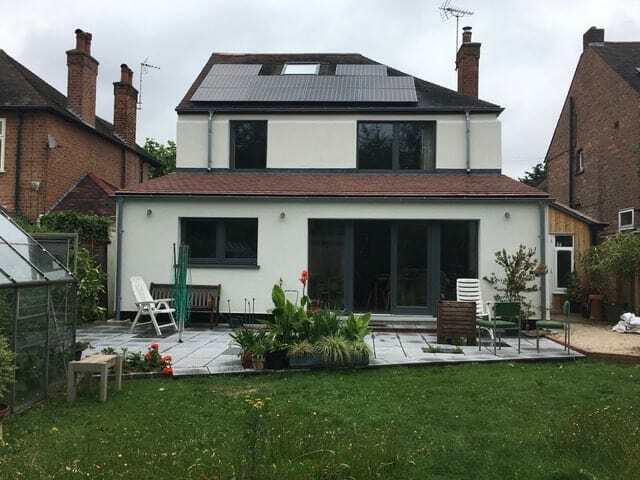 Step-by-step approaches to retrofit are becoming increasingly popular as a way to make undertaking a radical retrofit affordable and achievable over a period of time. Architect Gil Schalom worked with clients to develop a ‘whole house plan’ for the deep retrofit of a 1930s Arts & Crafts house in Nottingham, which could be implemented in two discrete phases. Particular care was needed during this process to ensure that the first phase did not cause any unintended consequences from any of the initial energy efficiency measures implemented. The first phase is now complete and clients are now saving for the second and final phase. 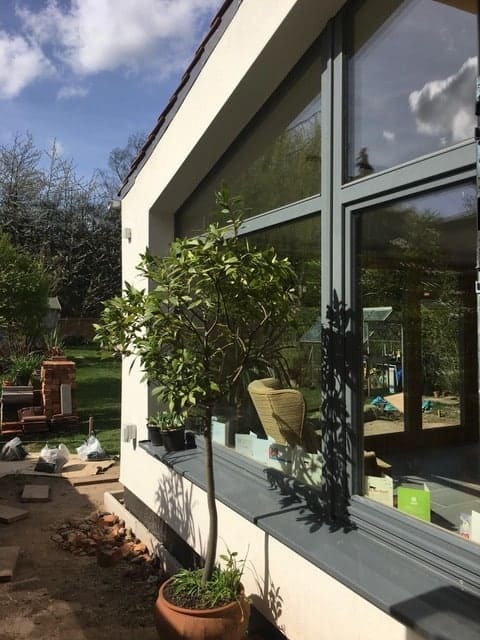 Green Building Store’s PERFORMANCE triple glazed timber windows and doors, including French doors, were chosen for Phase 1 of the project. 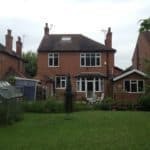 The addition of a rear single storey extension. Replacement of windows and doors in rear and side elevations with triple glazed timber. 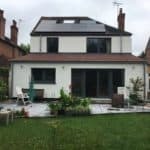 Applications of external wall insulation (EWI) to the rear and side elevations. 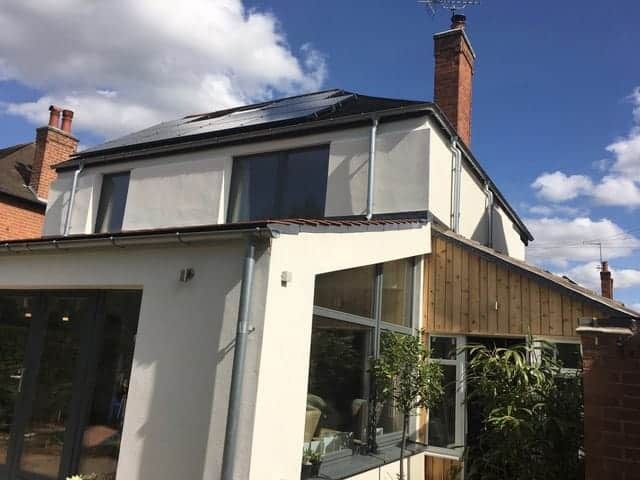 To avoid having to extend the roof to accommodate the 200 mm of EWI, the EWI is chamfered back to 100 mm to fit under the roof overhang with the metal rain pipes contoured to follow the shape. EWI was also extended down into the ground around the house down to the footings to minimise thermal bridging. Extension walls 140 mm solid concrete blockwork behind EWI. Marmox thermal break and thermal grade blockwork below DPC of extension. Insulation of 2/3rd of the ground floorby taking up existing suspended floor and laying 300 mm EPS insulation between new concrete slab and screed with 100 mm down stand insulation against the walls. Underfloor heating was embedded in the screed. Tile finish including new wet room shower floor. Extension roof. Clay interlocking tiles over battens, counter battens, taped Solitex Plus wind tightness intelligent underlay, 100 mm PIR sarking insulation over rafters, fixed with helical fixings through counter battens into rafters, 200 mm rafters fully filled with Rafter Roll 32 enhanced performance glass mineral wool. 12 mm OSB under supporting Intello Plus intelligent air tightness membrane / vapour control layer followed by battens forming service void and plasterboard with skim finish. Installation of a MVHR system to help prevent condensation issues in the partially-insulated house. Airtightness measures of Pro Clima membranes with taped edges and wet plaster to 2/3rds of house. All new windows and doors taped inside and out with Pro Clima tapes. Existing walls’ wet plaster was extended down to floor. First floor joist bearings were taped and the joist zone walls parged. Installation of a small room-sealed wood burning stove at clients’ request. Other chimneys taken down below roof level, filled with Vermiculite insulation and capped with insulated board. Replacement Fakro U6 skylight to loft room. Solar PV to rear (west facing) roof face, with Solic 200 hot water dump into new cylinder, to reduce use of new gas boiler. New high performance external porch door to replace modern metal sliding door. Bring integral porch into thermal envelope and retain inner stained glass door. Insulation of the remaining 1/3rd of the ground floor (suspended), possibly with the use of a Q-Bot robot to spray insulation under the floor. Upgrade the loft room insulation and airtightness. 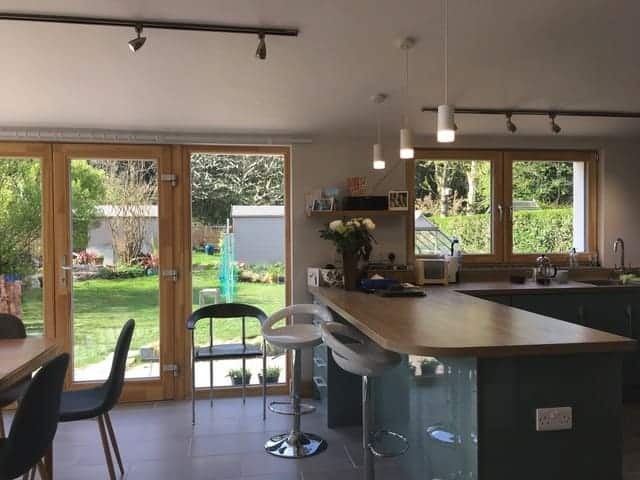 The rear extension created a large open plan space connecting the old living room with a new kitchen/ dining area. 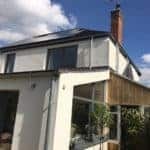 For architectural and energy performance reasons, no rooflights were added to the extension roof but good daylighting was achieved by the fenestration within the extension. 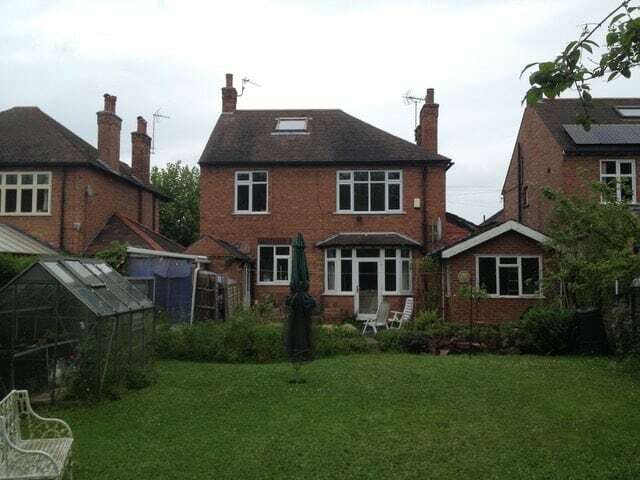 The garage used to project rearwards into the garden on the south side and the projection was demolished to create a sun terrace to the side of the extension. This also brings light and solar gains deeper into the plan. 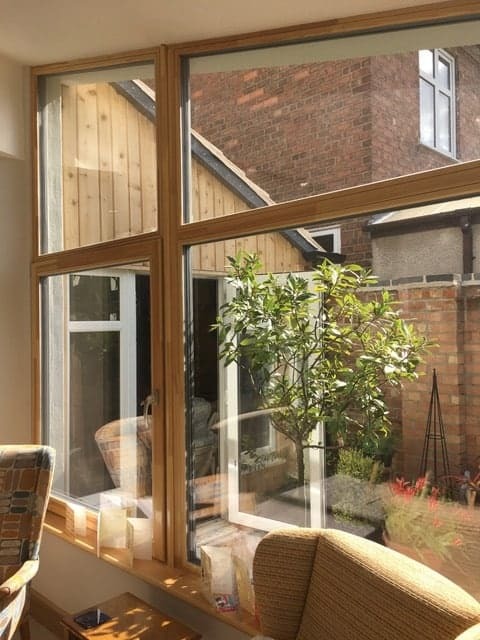 PERFORMANCE triple glazed timber windows and doors were specified for the project. 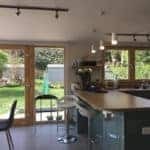 For the extension PERFORMANCE triple glazed timber French doors with two fixed sidelights were chosen as a cost-effective alternative to Lift & Slide/ Fold-aside options. 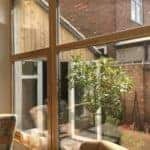 One of the upstairs bedroom windows is a Tilt and turn window with a floating mullion, providing uninterrupted views of the nearby nature reserve when the windows are open. Window & door frames were mounted conventionally, flush with external face of masonry as a cost saving option compared to a projecting framework. EWI was lapped over the door and window frames 60 mm to reduce thermal bridging. External door cills were supported off vertical concrete slabs outside the EWI.